Or, click here for all the info first! You want your painting to be a spontaneous process - you don’t want to get caught up in mindlessly recreating detail if you can help it. So you need to observe, look for patterns, shapes and easily repeatable elements, so you can create the illusion that you’re trying to achieve, without having to paint every single leaf. Although sometimes it may feel like that’s what you’re doing! Coming Soon - Streaming on Video Products. If you have purchased a downloadable product, you will soon have access to the streamed version too. This means you will be able to watch it on your iPad or phone (as well as your laptop or computer), as long as you have internet access! Yay for the future! Contact us if you're unsure of anything here. Click here to sign up to our workshops mailing list. 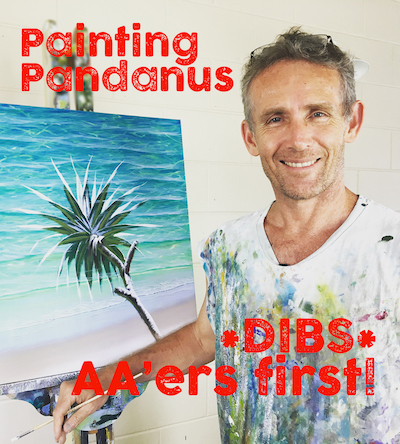 Learn how to paint a lovely beachscape here. 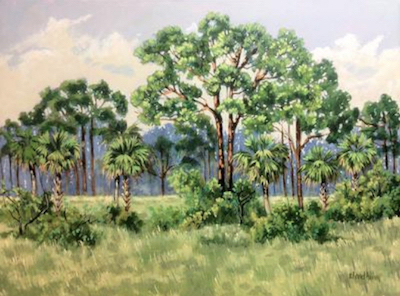 This month we're featuring Linda Blondheim's work, from Gainesville, Florida, titled "Pines and Palms". A sunny, open feel, and awesome use of texture. Well done Linda! 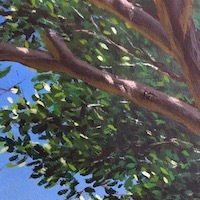 Click here for more info on Linda's piece "Pines and Palms"
What’s not to love about Canada! It’s like Australia’s frozen cousin :) So when I came across Amy Sheckleton’s signature “gravity" painting technique, I was thrilled to discover her latest project is all about Canada, and the idea of urbanism and environmentalism going hand in hand. Take a few minutes to check out the fascinating specifics on Amy’s Canada Project. Click here for more on Amy's project. Click here for this short clip. 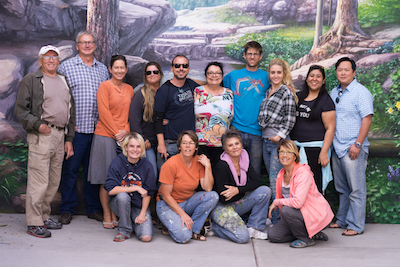 This month's story comes from our good friend and fellow acrylic explorer, Joe Cornelius - aka Mural Joe. 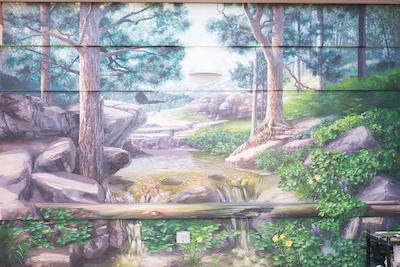 "I was asked to restore this mural, but then used the opportunity to re-paint it with new techniques and understanding that I had developed since the first time. I mainly focused on making the water look more lifelike using a strategy where I would first map out where the waves from the current would occur, and then coloring and adding reflection according to that understanding. I don't think I successfully modelled the waves completely accurately by any means, but it was a great exercise. I consider these kinds of very technical exercises to be valuable training for me to gain ability to create scenes from my imagination that look more believable. Every project for me is a research project. We learn to read an entire language and alphabet in order to communicate and I've found the same learning process to be possible with the appearance of complex textures like fire or water. It seams chaotic at first, but you can learn to read what you're seeing so that it all makes sense as you observe it in real time. But to be fair, I'm no expert reader and writer in that sense. It's just fun to know it's possible. The leaves surrounding the water were a fun element to improve as well. I gained confidence in using bolder colors and was able to get better depth by using pure black shadows and bright green highlights. I followed a real systematic approach of first applying green, then black to make recessed shadow areas. It was all painted wet on wet. Then I would use pure white to accent any green areas that looked like ends of leaves. The strategy of mixing both the black and the white with the green but not with each other has been a really helpful process for me. I use that same process of applying a color as a mid-tone first and then the shadow and then the highlight in all kinds of situations now. Not letting the shadow touch the light is the key with that strategy. I did regret making it such a technical job by like the third week. I ended up reverting back to just doing a lot of the water by feel instead of trying to understand every piece of it. It was just hard and I had a time limit. I think in all of my paintings there's the part that I wanted to master and then other parts that really got thrown together at the last minute. I'm just so obsessed with learning how something works that the final product takes second priority. I had a great time showing off the final piece to my workshop attendees. They were all very complimentary and encouraging. More than I deserve for sure. In that workshop we worked on that strategy of using the mid-tone, shadow and highlight so the painting served as a good model. 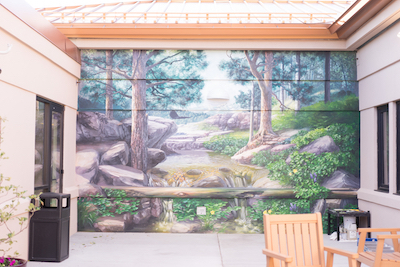 In the end, I’m really pleased to have my work contribute to a more enjoyable environment there at the hospital where people are coming out to get some air and really appreciate a bit of pretty scenery. I enjoyed a lot of good conversations with the employees and patients and doctors who would stop by to check out the progress. It's the same medical center that has my pirate ship mural in the paediatrics unit. It's just filled with very pleasant people.